Is One Day in Istanbul Enough? One of the biggest challenges of cruising is the very limited time you spend in a city. really scratch the surface of a city. Istanbulite, a bespoke travel agency that offers personalised and private tours in Istanbul. 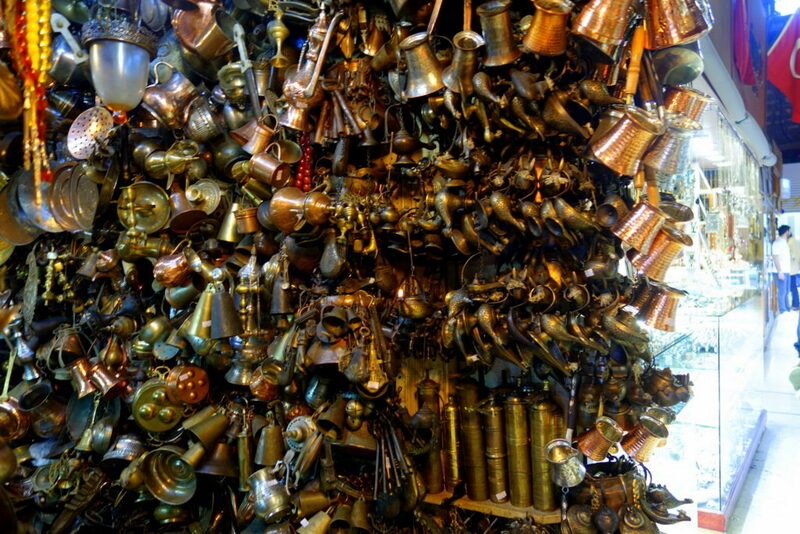 Istanbul is one city that’s always mystified me. Geographically both in Asia and Europe, yet not in the Middle East. 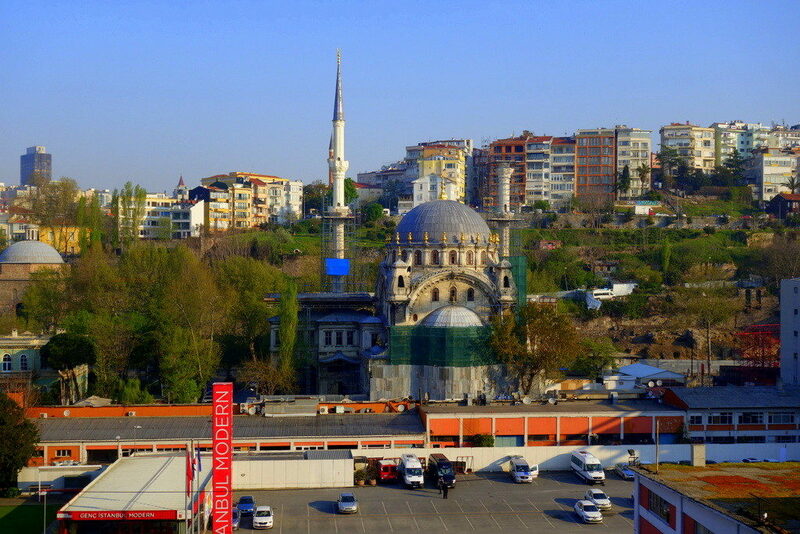 It’s the biggest city of the secular Muslim country of Turkey. 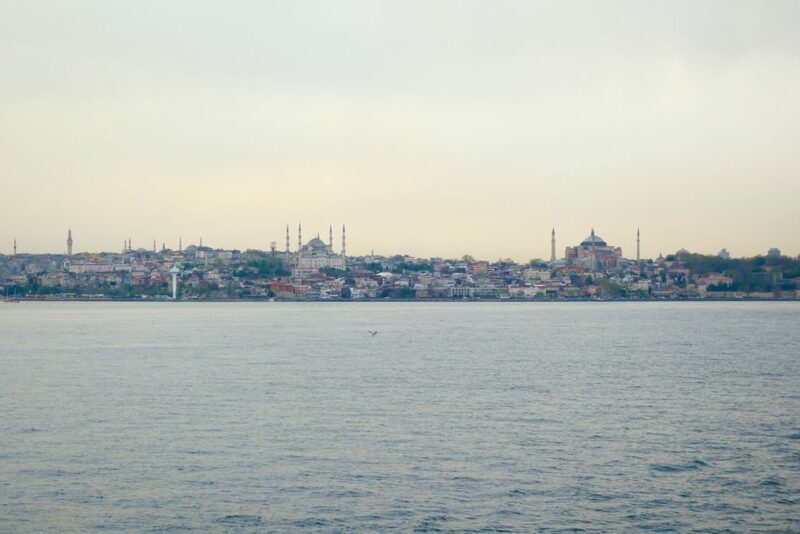 It’s a city that’s been under my radar for the last couple of years, so I was naturally thrilled when I found out that the Mediterranean cruise that I was going to has Istanbul as one of its port stops. So imagine waking up to this. Our cruise ship docked into the port of Istanbul early morning so it was still dark. Around 8am, when I drew open the curtains, this is what greeted me. I had to double check my thoughts: was I still in a cruise ship? Or am I in a hotel?? The port of Istanbul is very well-located and close to the city. Transport is not a problem. You can easily take a cab or take the Metro Rail. But this morning, we are being picked up from the port by Eda Sokmen, founder of Istanbulite. American-educated Eda is no stranger to the tourism business. 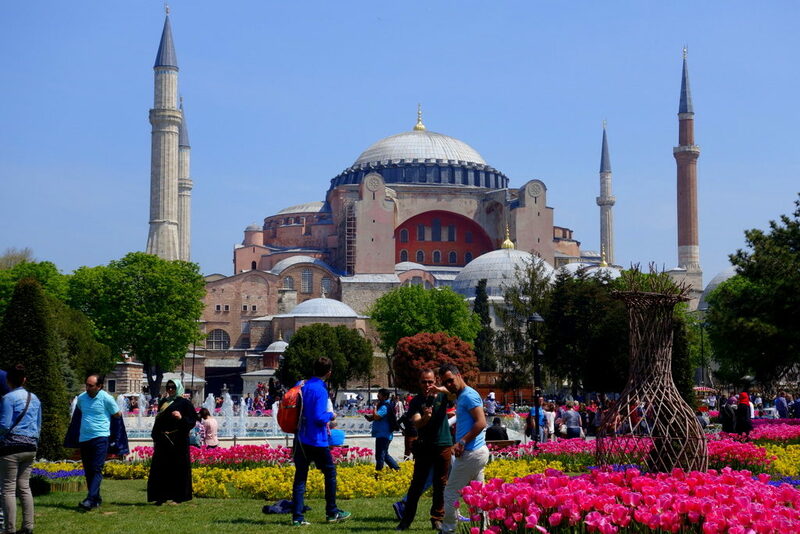 Her father has been a tour guide for 51 years now, so when Eda graduated from UCLA, it was just natural for her to return to Istanbul and start her own tour company, Istanbulite. 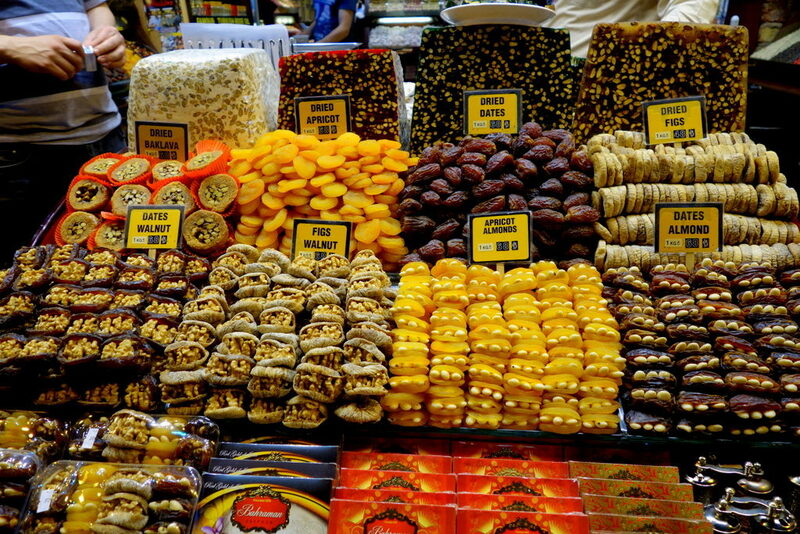 Istanbulite, by the way, is the term in which people who live and are from Istanbul are called. And Eda, who grew up in Istanbul, is just the perfect Istanbulite to show you around, most especially when you have limited time, just like us. Our first stop was the New Mosque. I love how Eda had devised our itinerary with much thought. Weeks before our arrival in Istanbul, she already gave her advise on which day / time it would be better to do the tour as she was aware of what days the Blue Mosque was closed. 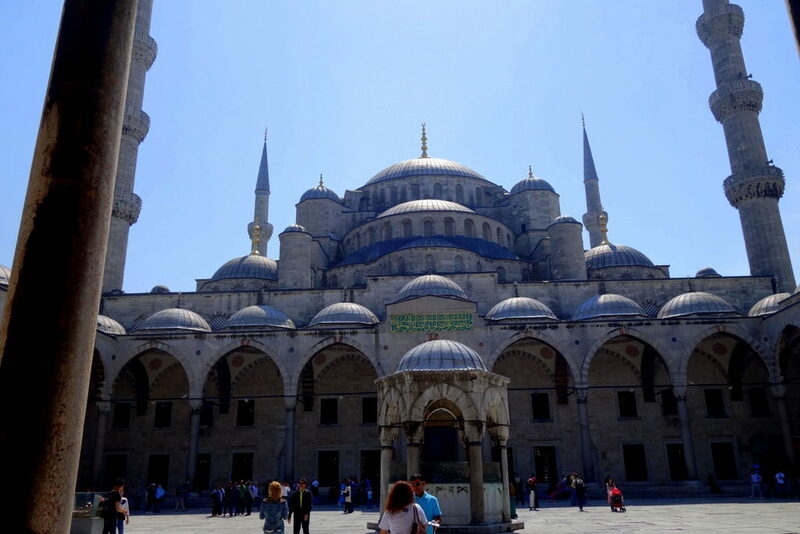 And even on the day we met, she strategised that it was better to visit the New Mosque first before the Blue Mosque so we could avoid the crowds. 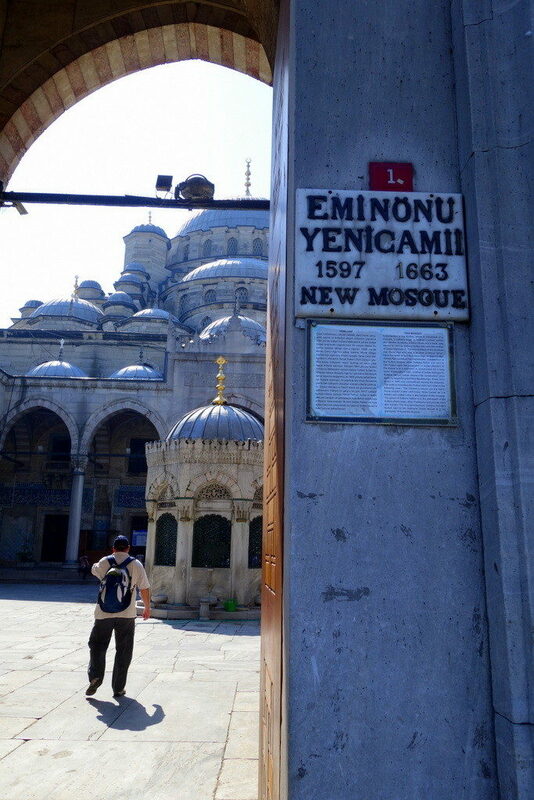 The New Mosque, or Yeni Cami, was completed around 1663 so there isn’t anything “new” about this mosque. However, this was commissioned in 1597 by the Queen Mother (mother of Sultan Mehmet III) and it was not completed due to the Sultan’s passing away. 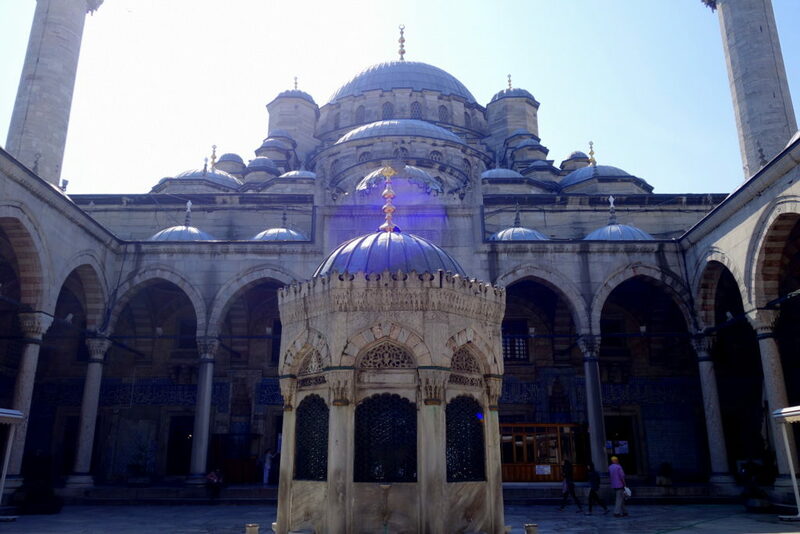 Six Sultans later, the mother of Sultan Mehmet IV took upon it to finish and complete the mosque. One thing I noticed right away with the interior of the New Mosque was the low chandelier. I learned that this is lowered because back in the day (and I mean 1600’s) people lit the “bulbs” (candle light) one by one by hand. 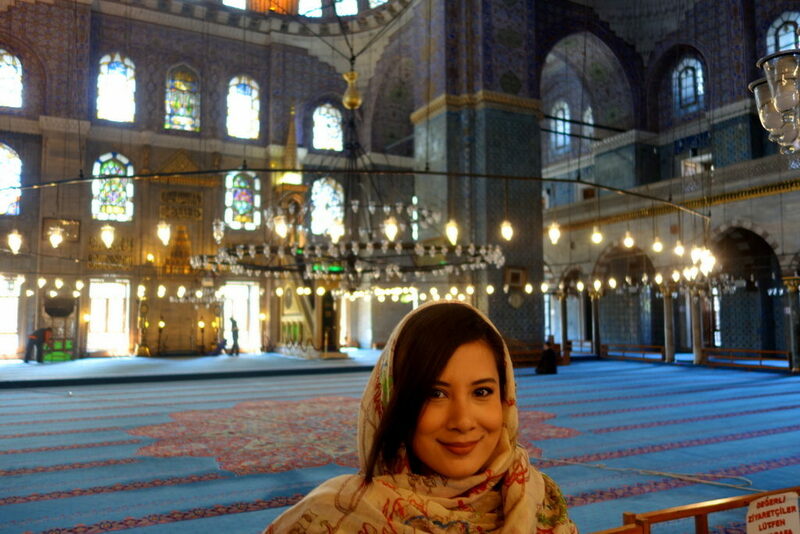 One tip I have if you are planning to visit the mosques in Istanbul: bring a scarf! It is necessary for women to cover their head in order to enter the mosques. If you do not have a scarf with you, they will lend you one anyhow. Right next to the New Mosque is the Spice Market, which we went to next. 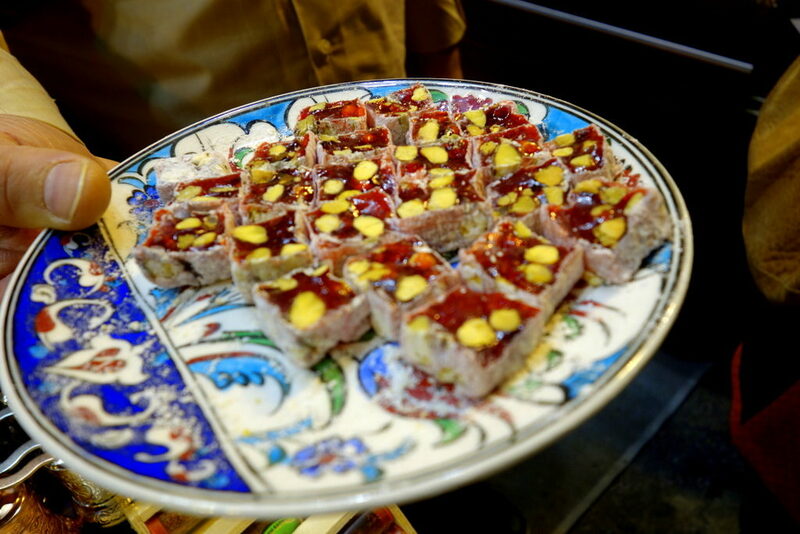 And it was here that my opinion of a Turkish Delight turned 180. Before being in Istanbul, my only exposure to Turkish Delight was the very nasty Cadbury’s chocolate covered Turkish Delight. So it was with trepidation that I took one of these that were offered to me immediately when we entered a spice and tea shop. The flavour was pistachio and pomegranate. Made with honey, it wasn’t jelly-like at all, and absolutely none of that soap taste. My cousin and I bought boxes of assorted flavours. They vacuum sealed it for us, but after about 2 weeks, when I got back to Australia, it was unfortunately not as fresh as it was on Day 1. On hindsight, I wish I’d enjoyed them all during the cruise! 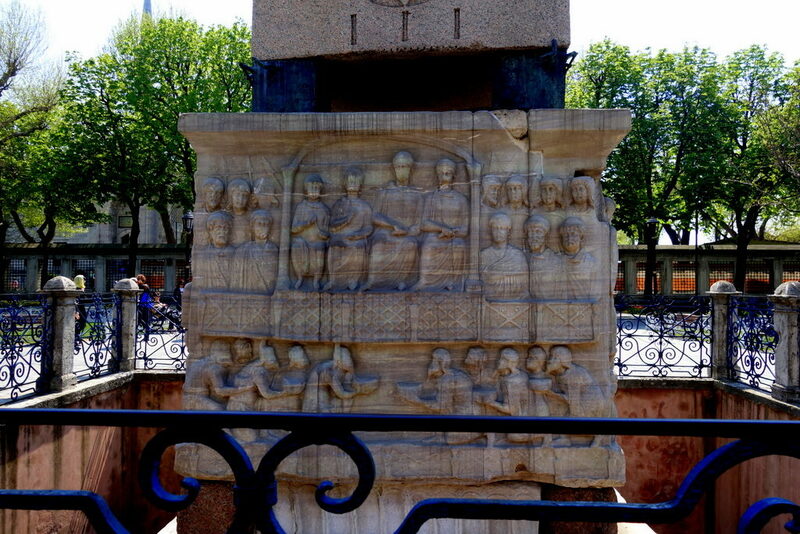 The Hippodrome was, for almost a thousand years the centre of Byzantine era as a sporting arena for chariot races and also used as a political venue wherein people would gather and stage riots when they were not satisfied with government ruling. The Hippodrome is now a city park called At Meydani. The Hippodrome is similar to Rome’s Circus Maximus, but the glaring difference is, the Hippodrome is currently a part of Istanbulites’ everyday lives. Both locals and tourists can be seen in the park, and I love how it is still an integral part of Istanbul’s soceity, albeit on a more laid-back scale (compared to it being a centre for chariot races and political turmoil). 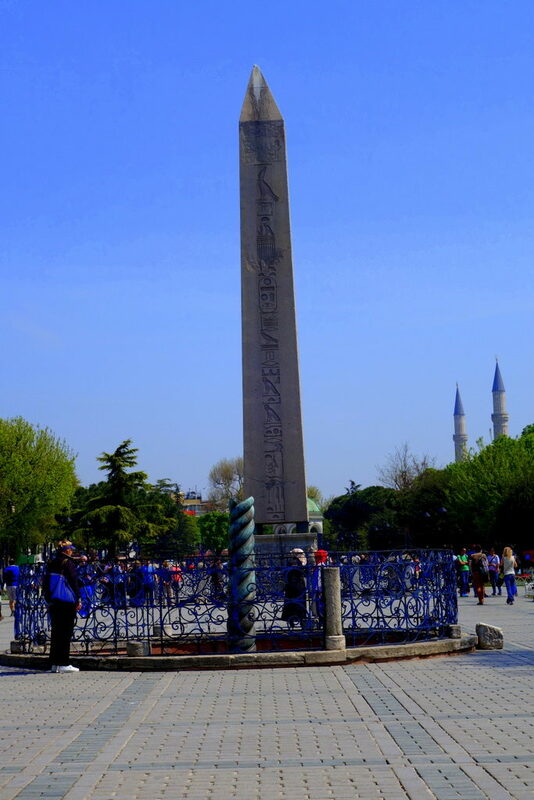 From the Hippodrome, we walked to the Blue Mosque. The Blue Mosque was built around 1609 – 1616 during the rule of Ahmed I. 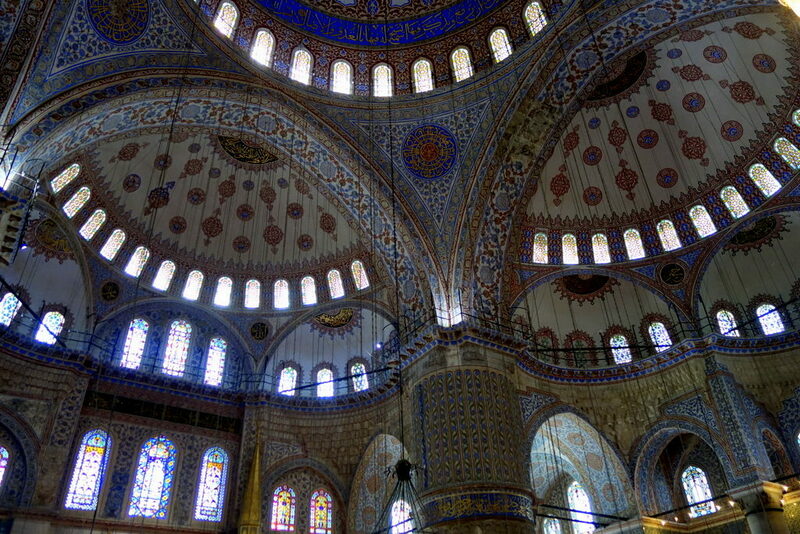 It is famously called the Blue Mosque due to the mainly blue-coloured tiles used in the interior of the mosque. The Blue Mosque was more crowded than the New Mosque, but it still wasn’t as crowded as I expected it to be. 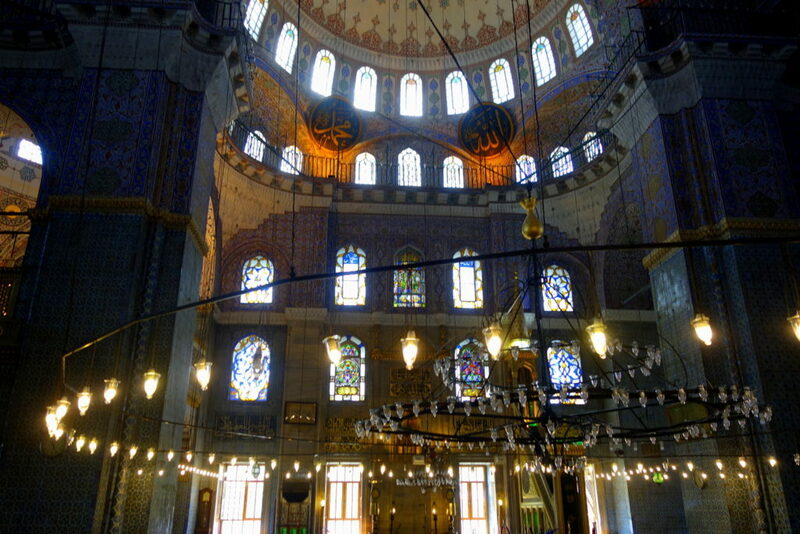 It is also called Sultanahmet Camii in Turkish, and paying a visit to the Blue Mosque must be planned carefully. It is closed to non-worshippers 45 minutes before call to prayer (there are 5 prayers in 1 day), so I was really grateful that Eda had these logistics in mind for our itinerary so there was no unnecessary waiting done, we slotted in just in time. As with all mosques, women are required to cover their heads (and upper arms), so having a scarf is handy. You are also given plastic bags to put your shoes in. Our next stop was the Hagia Sophia. There was a mini flower festival happening in the gardens outside of the Hagia Sophia and this is where I noticed the dogs of Istanbul. 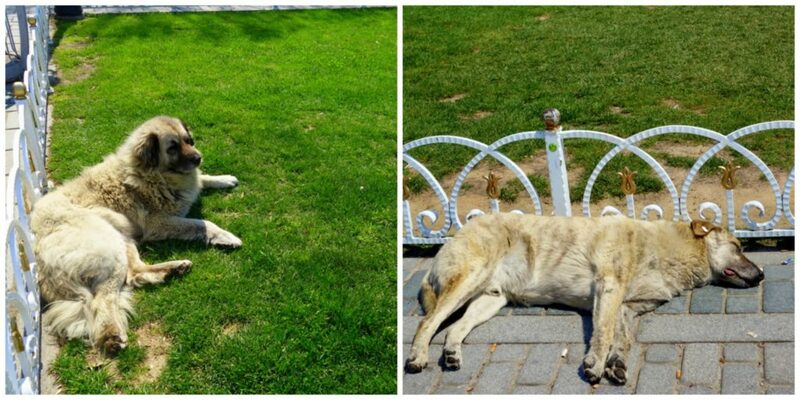 There are dogs that roam freely in Istanbul, and they all look very healthy and satisfied. I also noticed that they have tags in their ears. I once read that it is wise to gauge a city by how their animals (roaming ones) are treated, and I can tell that the dogs of Istanbul are having a cruise-y ride , and I’m happy about that! 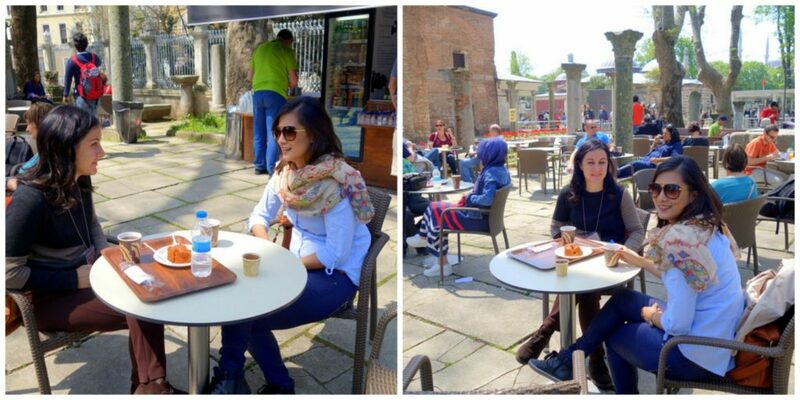 Just before entering the Hagia Sophia, we made a stop at an outdoor cafe where Eda treated us coffee and cake. It was a nice atmosphere, the weather was great and the crowd was just right. I absolutely enjoyed the break, and it got me thinking how easy it as that we were having tea and coffee just outside a very famous landmark, amidst ancient relics (see photo above right). If this was in another city, say for example Rome, either the coffee would cost a fortune and it would be so crowded, or this kind of scenario wouldn’t have been possible at all. 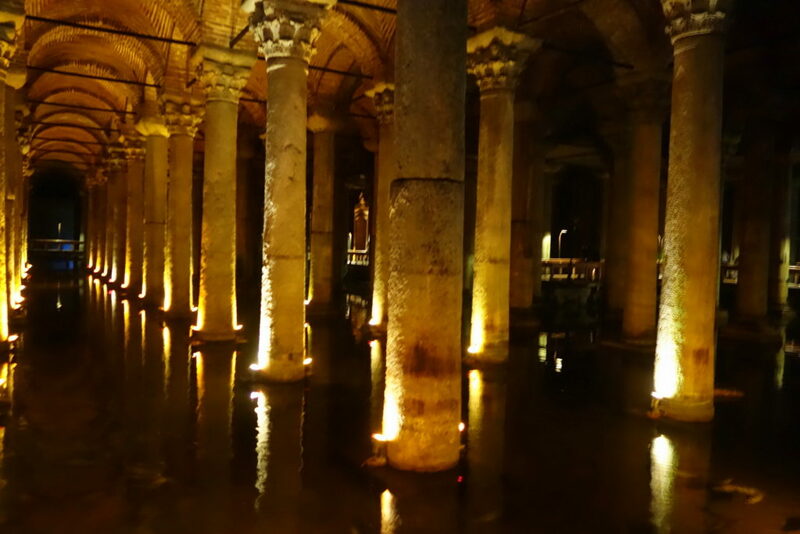 I did enjoy the laid back, unpretentious setup because Istanbul is not as crowded (yet) as other ancient cities. 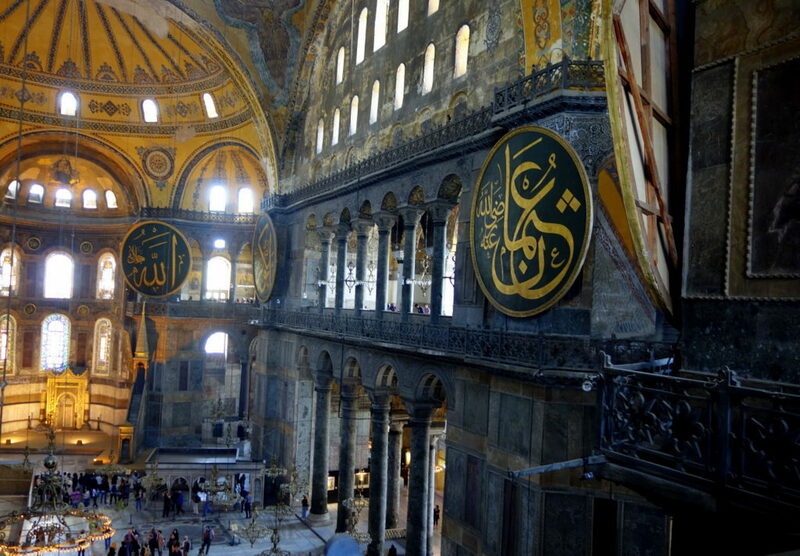 The Hagia Sophia isn’t actually a mosque but a museum. It was once a church, and then a mosque, and now it is one of the world’s most visited museums. Hagia Sophia has seen 3 religions under its roof ( First, it was Eastern Orthodox, and then it was converted to Roman Catholic, and then it became a mosque from 1453 until 1931). 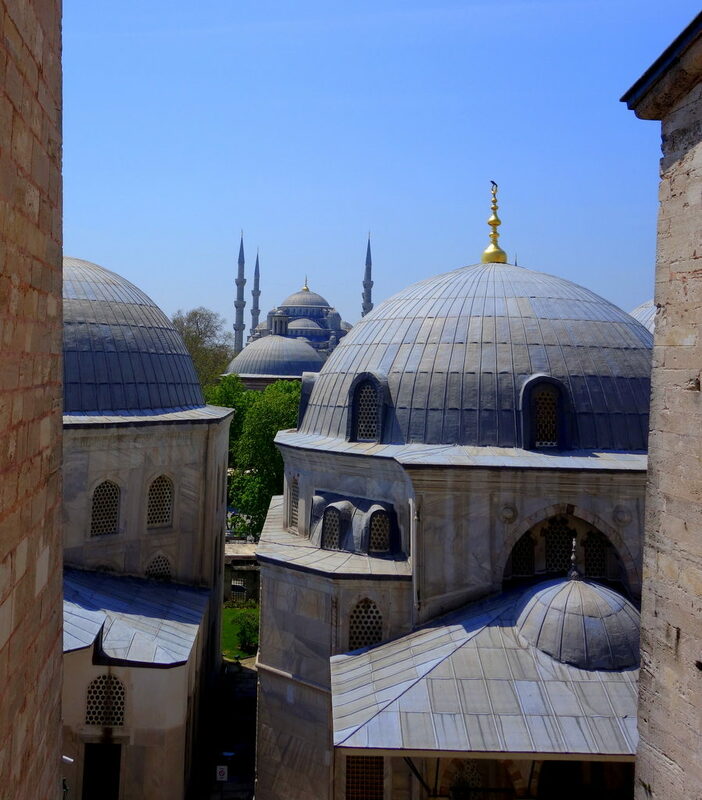 There are 2 levels in Hagia Sophia, and in one of the windows, you can get a fantastic view of the Blue Mosque and its spires. 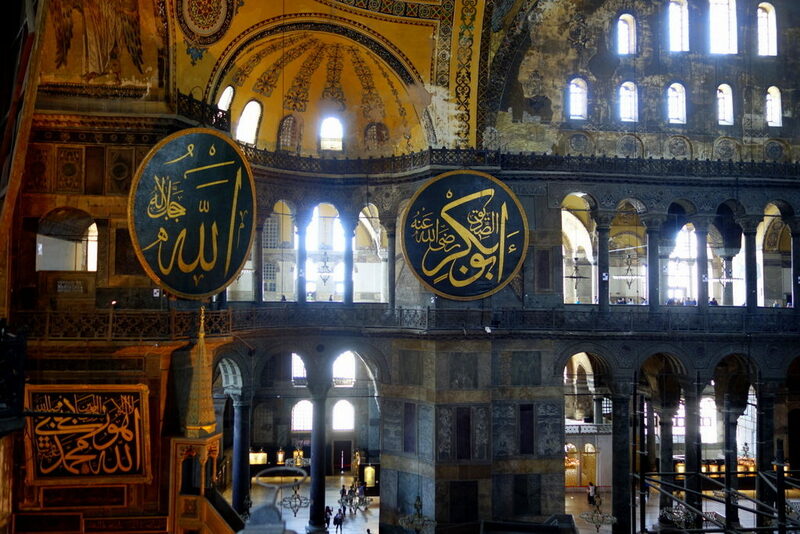 The remnants of the 3 religions are very evident all over Hagia Sophia and this is what makes it striking, that paintings and works of the previous religions are still being uncovered. 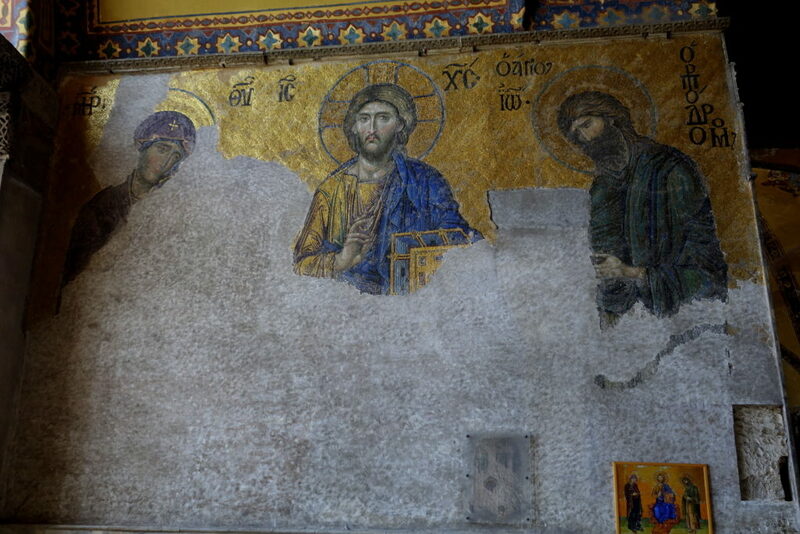 As Hagia Sophia is a museum, no head wear is necessary. There is an entrance fee of TL 30.00 (Turkish Lira) – about AUD 15.00. 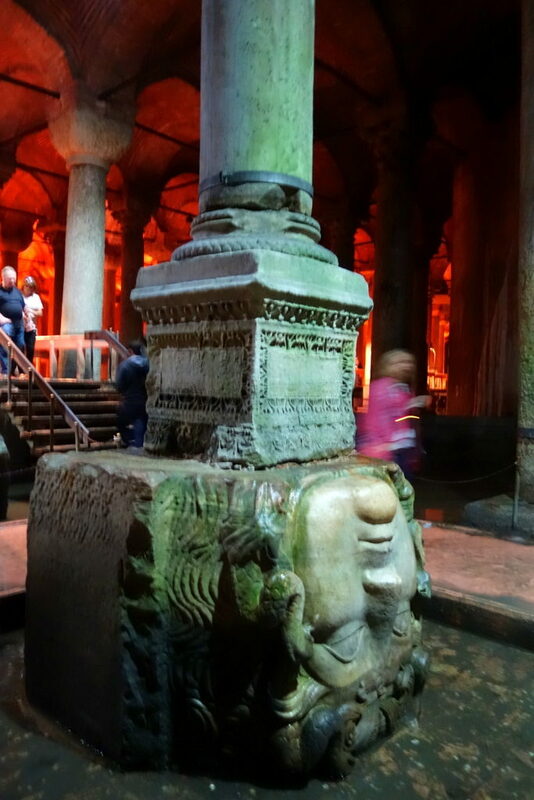 Just next to the Hagia Sophia is the Basilica Cistern. 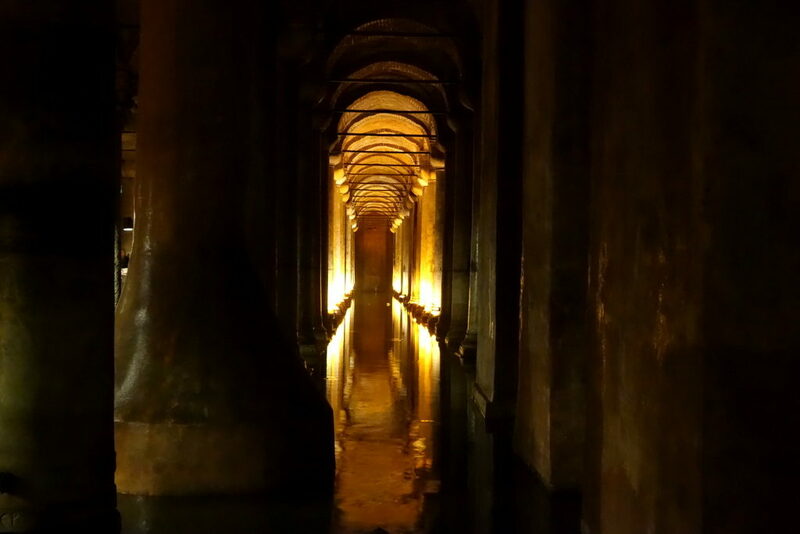 It is the largest cistern that lies beneath Istanbul (there are several hundreds!). Now there are koi fish / carp swimming freely in the cistern in order to naturally get rid of algae. You can also see Medusa’s head sculpture, which is in an upside-down position, believed to be intentionally placed this way to avoid Medusa’s gaze (lest one turns into stone!). 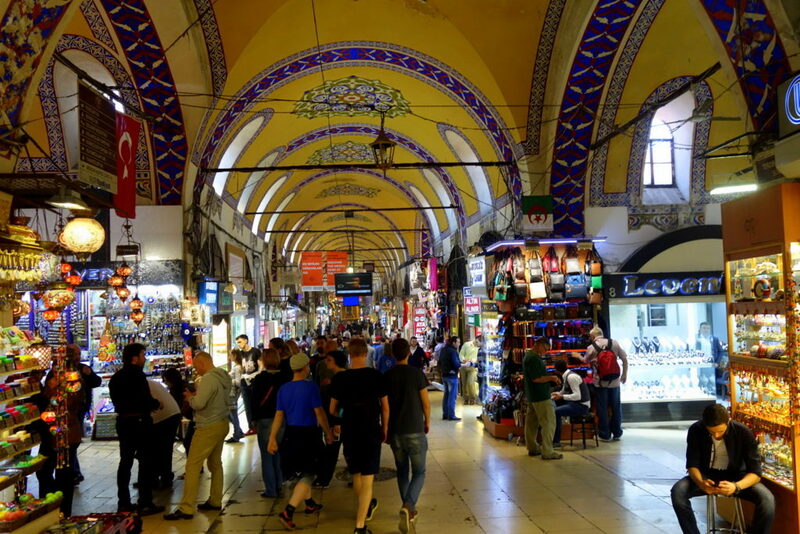 From Hagia Sophia, we headed to the Grand Bazaar, which is one of the largest and oldest covered markets in the world. With over 4,000 shops, this is also the world’s oldest shopping mall. 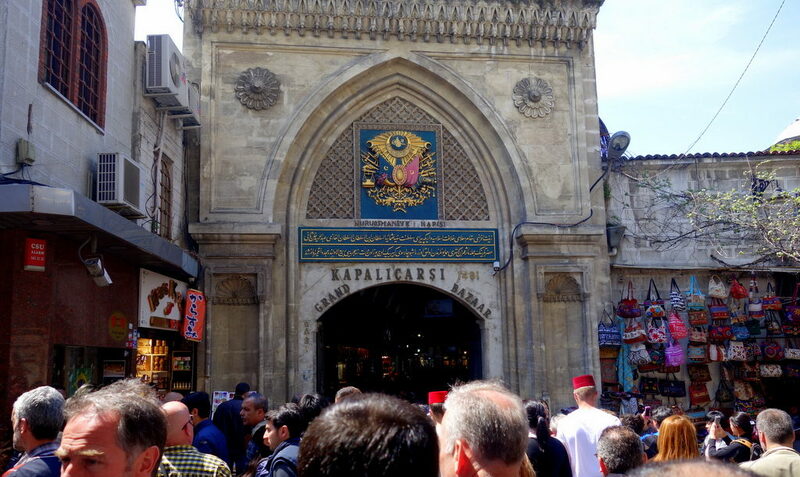 As the Grand Bazaar attracts between 250,000 – 400,000 visitors/shoppers daily, I was expecting a chaotic visit. But to my surprise (and relief), it’s actually very pleasant and roomy inside. The walkways are wide, and best of all, it is airconditioned inside. I’d been looking forward to the Grand Bazaar not really for the shopping but because when I asked Eda earlier what her favoutite Turkish food is, she said doner is one of them, and the best in Istanbul is inside the Grand Bazaar. She asked me whether I wanted to have lunch in a fanicer place or try the doner inside the Grand Bazaar, but warned that it is not really a formal ambiance, more like an eat-and-go setting, but we wouldn’t be disappointed with the doner. 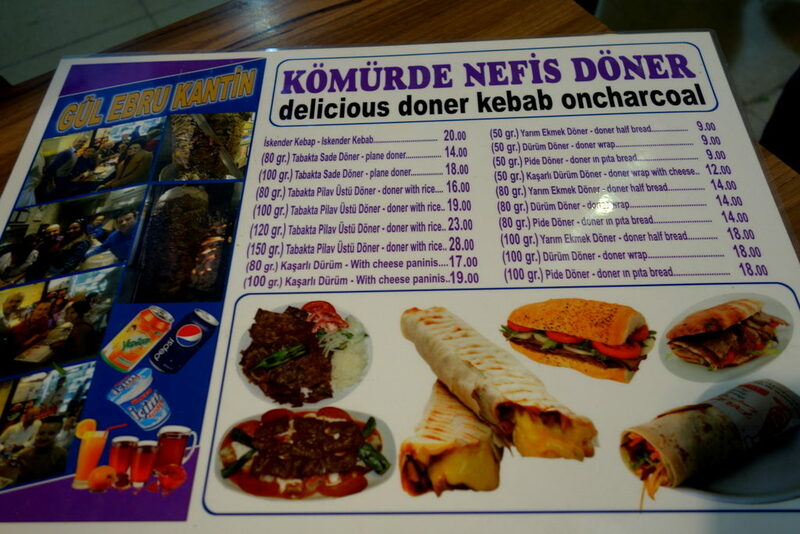 Naturally, I picked the best doner in Istanbul. And Eda wasn’t kidding when she said that this is the best doner in Istanbul, and that this wasn’t a formal setting. The place, Gul Ebru Kantin, is a small ‘blink-and-you’ll-miss’ eatery with very little space. When we were there, all the tables inside were taken, so we sat outside, next to the grill (above). The menu was very simple, and upon Eda’s suggestion, we all ordered the most basic doner in the menu. Just the meat (beef) and the wrap. Literally a 2-ingredient lunch. No onions, no cheese, no lettuce JUST MEAT. With the heat from the grill blasting giving me a beef-scented facial, I bit into the doner. And seriously, this was the most amazing doner / wrap I’ve had. It was probably 10X smaller than the doner / wraps that I have in Australia, but it was also 10X better. 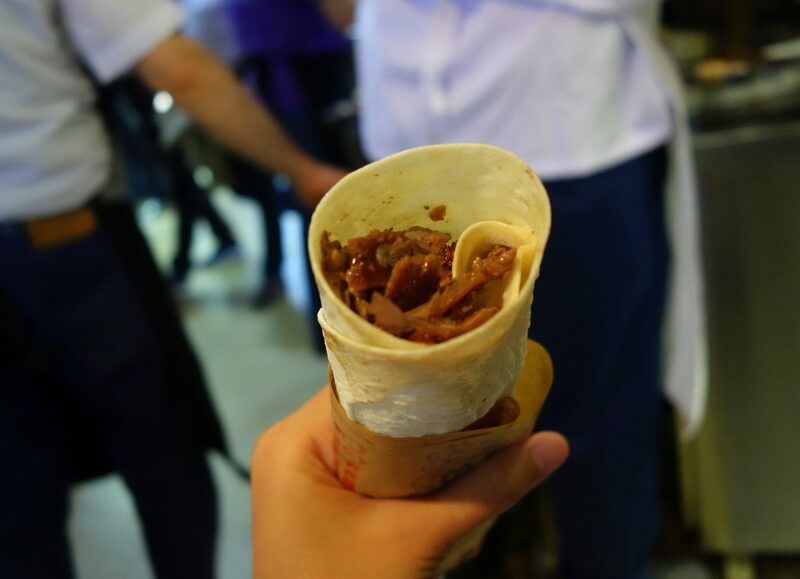 Without any filling (which in most cases take up the entire wrap space), I was able to really take in the meat flavour and its juices. And I’m quite proud of myself that I truly enjoyed this. I eat red meat very sparingly, and this red meat lunch was absolutely worth my red meat quota for the month. I can’t believe how tasty it was without any sauces , not even onions! A testament that this is truly the best doner in Istanbul – recommended by a local, and the place was also filled with locals. 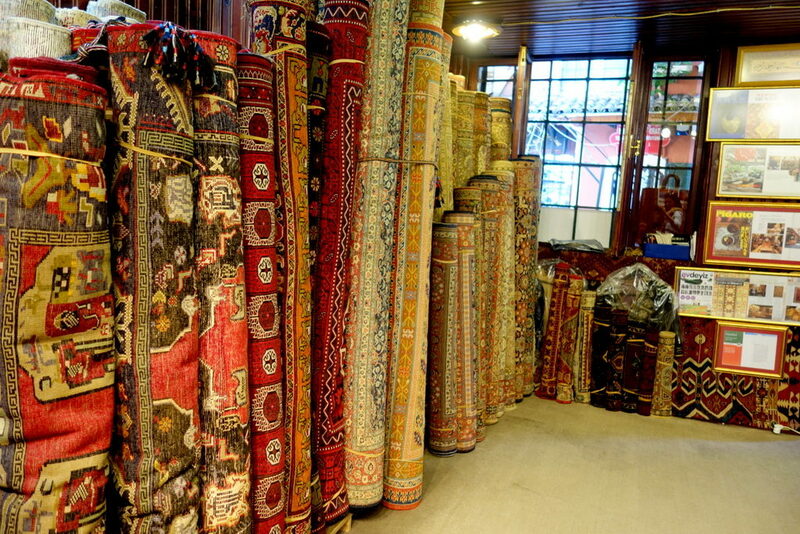 After lunch, we went to a place that sells carpets and rugs. 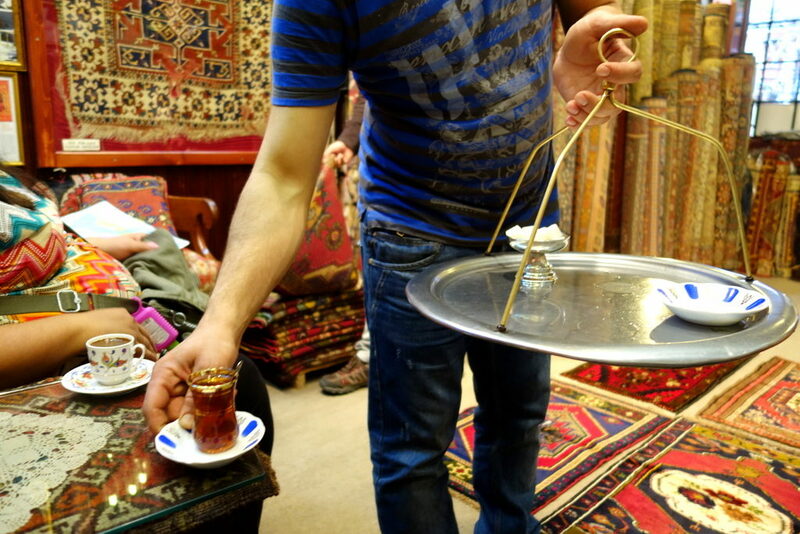 I love how Turkish shops/ businessmen always give you tea immediately when you enter their shop, like you are a very welcomed visitor that they’ve been waiting a long time for. I wish I could employ this kind of hospitality in the blog. Once someone opens Holy Smithereens, chocolate and champagne will shoot out from the viewer’s monitor. This tactic seemed to have worked because my cousin walked away with a brand new rug from Capadoccia, which she will frame. 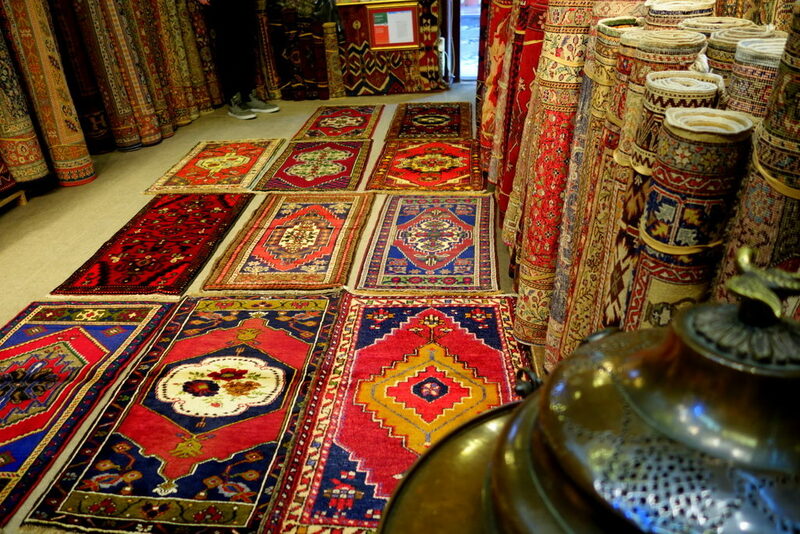 I do have to say the rug was really well made and had a striking pattern (it’s the 1st rug, 3rd row from the top). 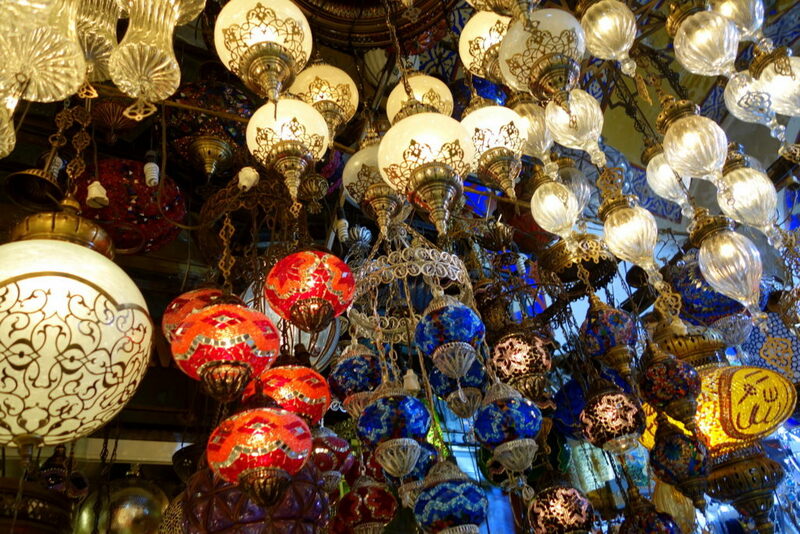 There were lots of interesting shops at the Grand Bazaar, just look at the finely carved tobaccos above, and the collection of magic lamps below. 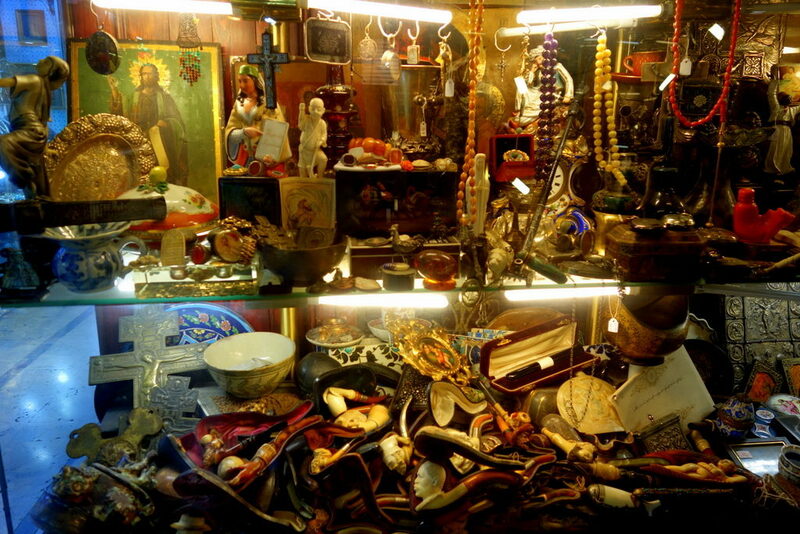 Items for sale are all grouped into sections. So there’s a scarf section, lamps and lights, etc. And each section is a huge labyrinth on their own. The lights and lamps section were the most dazzling. Rows and rows of colourful hanging lamps. Now you remember what a baby feels like staring at shiny crib mobile toys! 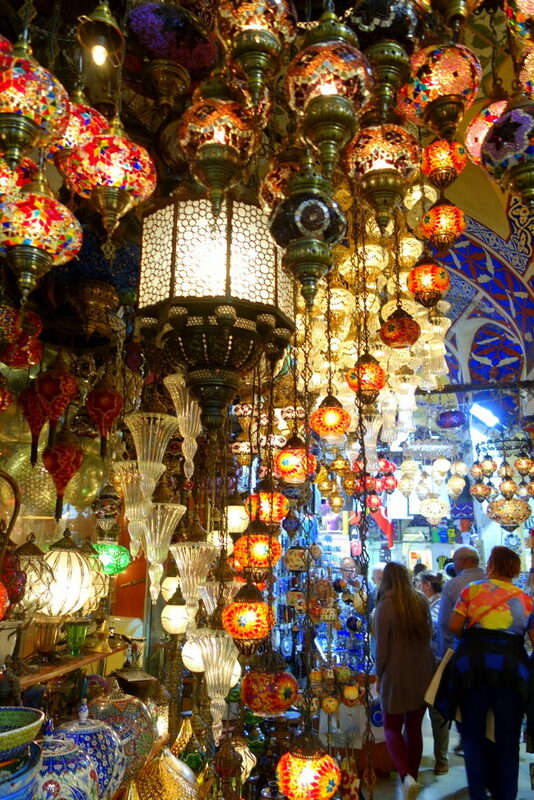 The Grand Bazaar was our tour’s last stop and we finished around 4PM. We were then dropped off back to the port by Eda and the private van/ driver. Well I’ll say, I think we had an extremely productive day. A day in Istanbul is NOT enough at all. But browsing from the beginning of this post to the end, I think we’ve covered quite a lot for 6 hours. Going on a private, customised tour like Istanbulite definitely has its edge especially when you’re on a cruise with limited time. With this being a private tour, you don’t spend your time waiting on other people and the best part is there is no rigid itinerary. Eda takes into acocunt your interests and will suit this to the itinerary for the day. I also appreciated how Eda was very patient and considerate. My cousin has an injured knee and had trouble walking / climbing steps and Eda would think beforehand where my cousin can either wait for us (while we proceed to sites that would be challenging for her to get to), or detour to take an easier path. And Eda being a local (and owning the business) makes all the difference. She is very knowledgable on both historic events and modern society of Istanbul. I imagine she would be the perfect host to show one around modern Istanbul (if we only had more time!). And though we only had 6 hours together, she eagerly filled us with tips and advice where to go, as we had a free evening to ourselves. (where we watched a religious dance , the Hodjapasha and went to dinner). My only comment / suggestion is that it would be better if guests were given water bottles during the tour. A simple thing but I imagine would make a world of difference. There’s nothing more dramatic than leaving a city with this panoramic view, while sailing away from its shores. After our tour with Istanbulite, we were on our own for the evening and even if we ran into an unfortunate (and frustrating) incident where I got duped by a cab driver, I still would like to return to Istanbul one day with Zombie in tow. And I’ll be sure to stay longer than a day. We were guests of Istanbulite for this tour but all opinions and views are strictly mine, there is no obligation to write a favourable review. Excluded in the rate: VAT, Lunch, Museum Entrance Fees. Istanbulite also offers Bachelorette's or Hen's Weekends (apparently very popular for brides-to-be in the UK!) and Fashion Tours of Istanbul. You can view all their Istanbul tours Here. Wow! You saw so much in one day! I think I went to the same or similar Turkish delight place in the Spice Market and I also couldn’t believe how good it was! 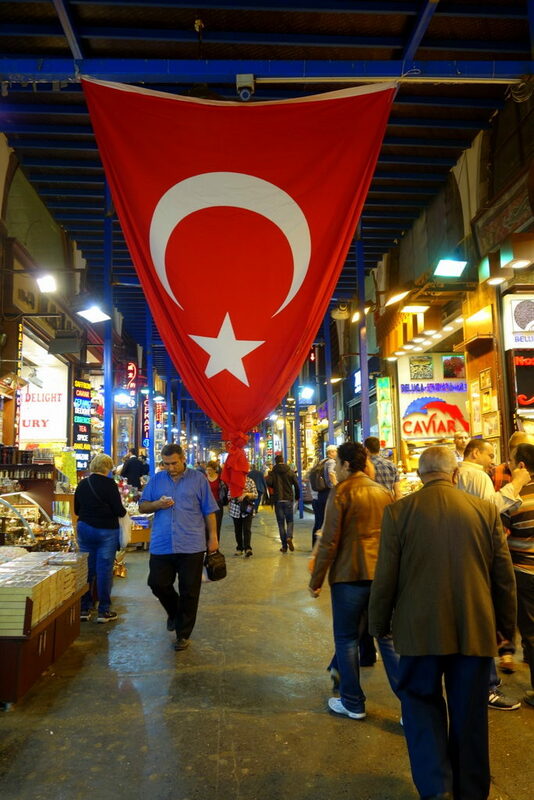 I much preferred the Spice Market to the Grand Bazaar I found it much easier to find my way around! Thanks Angie! Yes quite happy with what we covered in one day 🙂 I wish I spent longer time in the Spice Market, but we needed to get to the Blue Mosque before noon to avoid the prayer call. And from the little I uncovered of the Spice Market, it seems to look more “authentic” and less touristy than the Grand Bazaar! Haha…. a beef scented facial, well doesn’t that sound delicious, reckon that would be an excellent sales pitch to motivate men to better care for their skin. Oh and totes hook a sister up if you do figure the champagne and chocolate shooting out of the monitor for every new visitor thing. So Istanbul looks like a pretty neat part of the world, not really somewhere I have ever really aspired to visit, but it has jumped up a few pegs on the list, thanks my lady! That Doner looks like my kind of facial! LOL! You certainly packed a lot in – I think there’s a lot to be said for personalised touring, we did it once in South Africa and it was well worth the extra coin, and especially when time is so tight. I always love visiting Holy Smithereens but I agree the pop out champagne and chocolate would be the cherry on the cake! Hi, thank you for visiting Istanbul and for this great detailed trip notes. Once I read your lovely post, I wanted to mention about the luxury travel advisor of Istanbul. To get the most out of this unique city from shopping to extraordinary museums, best attractions, hand picked luxury hotels and famous fashion designers in Nisantasi/Istanbul.